Sometimes it can seem like there isn’t much happening on a Sunday night. However, what you may not know is that here in Haddonfield on Sunday nights there is fun, laughter and dancing at Grace Church. 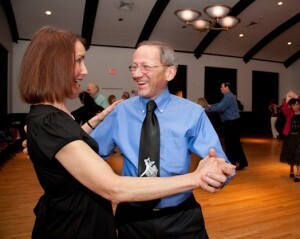 Almost every Sunday night, Dance Haddonfield hosts ballroom dance lessons and a dance, with intermediate lessons at 6 p.m., beginner lessons at 7 p.m. and dancing from 8 p.m. to 10:30 p.m. Dance Haddonfield is something fun to do on a Sunday night for anyone from age 16 to 100. “Ballroom dancing is athletic, creative and it’s social,” said Philip Zoebisch, president of the Delaware Valley Chapter of USA Dance. Dance Haddonfield is a part of the educational non-profit Delaware Valley Chapter of USA Dance. USA Dance’s mission is to promote ballroom dancing in any way possible. Dance Haddonfield, in particular, also wants to promote Haddonfield itself. It does this by offering the lessons and dance at Grace Church, located at 19 Kings Highway East, as well as giving away Haddonfield-specific door prizes each night. It gives away a $30 townwide gift certificate, tickets to Haddonfield Play and Players and a lottery ticket where someone could win $1,000 a week for life. Dance Haddonfield was started in April 2000, when Murphy was encouraged by friends to start a dance group. There were places to dance in Philadelphia but nothing nearby. Murphy tried to hold that dance at a few different places nearby before finding space was available at Grace Church. “I went over there and fell in love,” Murphy said. Since its beginnings, Dance Haddonfield has been named Best of South Jersey in 2009 and Best of Philly in 2010. Ballroom dancing is a social activity. Couples and singles come out to dance, but no one is limited to one partner. The dancing portion of the night hosts at least two mixed dances, in which everyone dances with everyone. A new person automatically meets all the attendees during these dances, so there is no need to be nervous about talking to someone. “As a social activity, it is wonderful because you automatically meet people. It’s hard to be a stranger when you’re holding someone or dancing with someone. Also, you automatically have something to discuss, dancing,” Murphy said. Every Sunday, about 60 to 80 people attend, though they can go up to 100 some nights. About 80 percent of the attendees are single, and some have made connections both in their social life as well as their professional life. Murphy met his girlfriend and Zoebisch got his job through Dance Haddonfield. “Expect to have fun, laugh, smile and enjoy yourself. It’s a good place to get away and enjoy your night,” Murphy said. For a night of lessons, food, refreshments and music at Dance Haddonfield it is $15 and combined with intermediate lessons it is $20. As a non-profit, the money is used to help pay for the space, instructors, food and giveaways. Those who are attending are asked to dress nicely and to wear leather bottom shoes as to not slide. There are no jeans, sneakers or grungy clothes allowed. Coming up for next Sunday on Jan. 25 beginner dancers will learn the Fox Trot and intermediate dancers will learn East Coast Swing, taught by Alan Saperstein. A full schedule can be found on www.dancehaddonfield.org/schedule. For more information about Dance Haddonfield or to join USA Dance, and save $2 each night, visit www.dancehaddonfield.org.